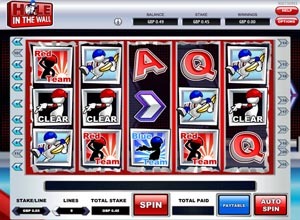 Hole In The Wall Slots - Review & then Play for FREE! Hole in the Wall slot is a 5 reel 20 pay line slot machine; this means there are 5 reels where you are able to spin for winning combinations. Hole in the wall is based on the worldwide hit game show and tests your what you are made of! Will you be able to keep yourself from plunging off your platform? There is only one way to find out! Before you begin playing for real, you are able to play for fun using the £1,000 credit. You should also be directed to the payable at the bottom of the screen which lists all of the possible winning combinations and its worth. Step 1 – To begin play simply press the spin button. You can increase the denomination of a spin by pressing the up and down arrows. A maximum stake per line is £10 and minimum is 10p. You can also choose the amount of lines you want to bet on by pressing the increase and decrease buttons. Your total stake is your lines multiplied by your bet. There is also an autospin option on this game that can be activated and de-activated at any point during your game. Step 2 – You will come across a couple of bonus features. If you trigger 3 or more bonus symbols scattered across the screen you activate the exciting Hole in the Wall bonus feature. To start this feature click on one of the animated symbols to reveal a ‘base award', the more symbols that were on screen when the bonus was triggered, the more attempts you will have against the wall! Hole in the Wall slot is an action packed game where you have to risk the chance of being pushed in the water to win! The graphics and animations are engaging whilst the easy to navigate play buttons means you can concentrate on spinning to win.